Mindfulness is the quality of attention we bring to the events in our lives. It is the process of bringing our awareness to what we are doing at the time we are doing it. It is purposely being engaged in our actions, feelings, physical sensations, and thoughts. Becoming aware of where our attention is, we can bring it back gently to its original intention, return gently to our original purpose. This increases our choices in a situation, preventing automatic reactions from diverting us from our path. Do I need to know any meditation techniques or anything like that? There are no special techniques you need for this course. Mindfulness-training is more than just meditation although meditation allows us to practise mindfulness. In the course, we will learn many ways of being mindful and discover that when we do things mindfully we are in fact meditating. I’ve been practicing meditation for many years. Will this course interfere with the techniques I already use? Will these techniques interfere with the ones in this course? The techniques in the course are likely to be consistent with your previous experiences. There are many different meditation techniques; however all techniques begin with awareness of the breath. In this course, we will begin with awareness of the breath and, in the later part of the course, explore briefly different techniques. If you are very skilled in any one technique, part of your practice may be to bring yourself gently back to the breath in the early stages of the course. When you are practicing on your own, you can incorporate your previous skills into the practice any way you wish. I’m nervous about some of these techniques. What if I’m uncomfortable about doing them? The core skill you will be learning is to recognize what you are feeling at the time you are feeling it. If that feeling is discomfort with any technique, the skill you are practising is to accept your feelings, thoughts, or physical sensation as a valid signal to be respected. Act accordingly. If you feel physical or emotional discomfort with any exercise, simply stop and breathe until you are ready to continue. How is this going to help my symptoms? Often when we experience our symptoms, we tighten mentally or physically around them hoping we can diminish the intensity of the symptom. Usually this effort only increases tension, creating a cycle of symptom intensity, control, and stress. Over time, we then lose sight of what is the real symptom (the original feeling or sensation? the tension? the frustration?). Our reactions become erratic and our perceptions are clouded by negative emotions. Mindfulness allows us to be present to what is actually happening and to lift the fog of our expectations, ruminations, and judgmental self-statements. The course is in the evening. What if I feel so tired that I won’t absorb anything or can’t keep up? Sometimes stress reduction programs can cause stress, not because of the program itself but our expectations. As best you can, recognize the beginnings of your expectations (I have to keep up, I have to absorb things!) and your worries (what if…?). There are no expectations of performance but we all have a hard time believing that. In practicing mindfulness we come to the course each evening, open to just being there and allowing the different aspects of the course to filter in like rain on parched ground. Sharing the week’s experiences of the homework with the other practitioners is optional. Many of the exercises we will do together allow practise of being who we are at the moment. And, who you are at the moment may simply be listening and allowing things to happen in that class with no anticipations of what will happen in the next class. Taking a course is fine but what about after? How can I continue without the support of the community I’ve worked with for the eight weeks? (We are planning an online resource for ongoing support.) There will be continuing classes once a month to refresh your practice and a list of practice centers in the community will be made available. Is this a religious program? Is there scientific evidence for this program? The practice of mindfulness is over 2600 years old. It has its origins in Eastern traditions of meditation and yoga. It is found both in Eastern and Western contemplative religious traditions. However, it can be practised outside the structure of any Eastern or Western religion. This program has been conducted in many hospital settings in Canada (Centre for Addictions and Mental Health, Toronto) and the US (University of Massachusetts Medical Center, MA) with success among populations of persons suffering from depression, anxiety, chronic pain, and work stress. 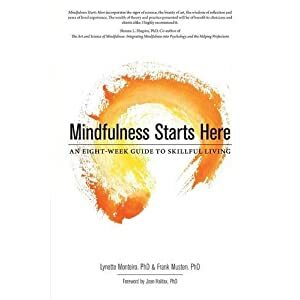 There are research studies published in accredited medical and psychological journals that show mindfulness-based programs compared favourably to conventional treatments. If I’m on medication, should I continue to take it? Will I be able to stop medication after the course? Maintain your medication schedule as prescribed. Never make any medication changes without consulting your physician. The program is focused on developing skills to make healthy decisions for yourself. The decision to adjust or stop your medication requires a clear understanding of your needs – an understanding, which only develops over time. In the course, you will be facing many changes in your stance towards your symptoms. It is best to allow these stances to consolidate and be confirmed before making other changes. Will this program help me fulfill my dreams? After this course, you may awaken from your dream and see what is truly possible.